This publication is a little unusual, as it is in the form of playing cards. 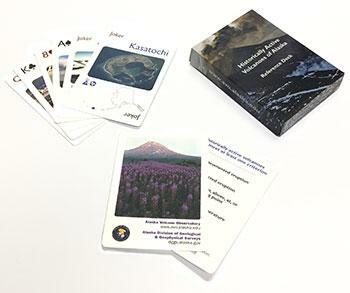 Each full-color card provides the location and photo of a historically active volcano and up to four icons describing its historical activity. The icons represent characteristics of the volcano, such as a documented eruption, fumaroles, deformation, or earthquake swarms; a legend card is provided. See DGGS website here for more information and how to order.